It is a frozen Indian desert. It is often described as “traditional indian subcontinet ice cream”. Made from full cream milk thickened with Koya and badam (Almond). As a healthy option have replaced full cream with low fat Milk and Milk powder. Honey is used in place of Sugar. In small bowl soak saffron in a little warn milk and keep aside. Add milk powder-corn flour mixture, honey, cardamom powder, soaked saffron strands and simmer over a medium flame for 8-10min/until the milk thickens a bit. As it thickens turn off the flame and allow it to cool down completely. As it cools down pour the mixture to the kulfi moulds. Refrigerate for 3-4hours. To demould: just hold the mould under running water for a minute and demould. Quantity of sweetness can be increased or decreased as per the taste. Posted on July 20, 2014, in Dessert, Indian, International, Kids recipes, Sweets and tagged Chitras healthy kitchen, drchdietfood, Honey Ice cream, Honey recipes, Low fat Ice cream recipe, prakruthi honey, prakruthi honey bangalore, prakruthi honey recipes. Bookmark the permalink. 42 Comments. I’ve had Kulfi and love it. Glad to see the recipe. I want to make it, it’s delicious and I love your healthier option. Wow!!!! I totally want to try this Chitra! And this looks gorgeous! awesome. Love the use of honey! Lovely dessert to follow a good, hot curry. Thanks. Thanx Hilda. …glad you liked it…. oh my gosh. i am so happy i found your blog. i love love love your style/flavors in your cooking. thank you so much! Thank you so much you liked this recipe…Wait to hear how this turned out for yourself..
I’ll let you know, thanks! Just this week I read about a fellow who makes kulfi ice cream in New York and I almost died. 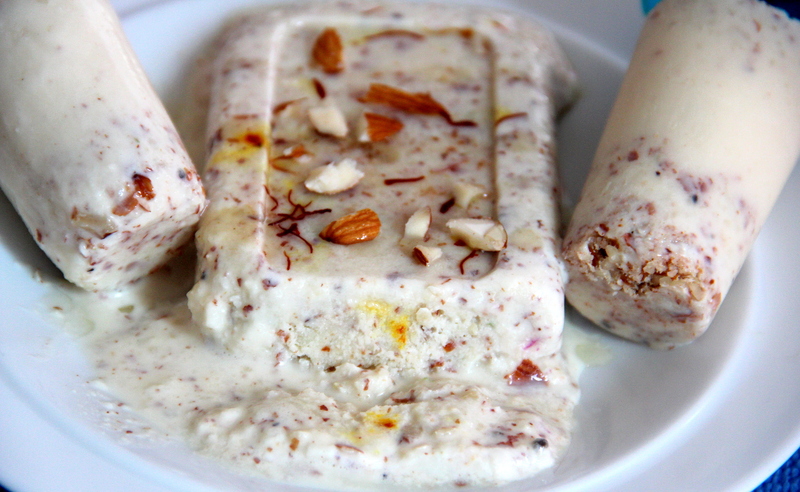 I have to have to have to make this recipe because I love kulfi. I love this shot of the melting kulfi!!! Very exotic, sophisticated and I’m sure it’s beyond delicious too, right? Yes Vidya..It is becoming difficult to stay at home.. OooH!! Look at that!! Sin and crunch and temptation all in that slab and those rolls! I love kulfi! Never thought to make it, thanks for the recipe! Here is something for me to try, instead of more ‘traditional’ american desserts.